Suede Lace-up Wrist/Forearm (10in.) – Pacific Medical, Inc.
Perforated suede material with laced closure. Pull strap provides easy application and adjustment. Ideal for post-op rehab, general sprains and strains. 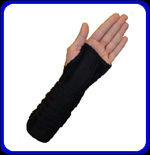 Extended wrist and forearm support. X = 2 XS < - 5.5"
X = 3 SM 5.5 - 6.5"
XS 4.4" - 5.5" Ped S/M 3.5" - 5.0"
SM 5.5" - 6.5" Ped L/XL 4.5" - 5.5"